What challenge(s) apply to your project? Describe the problem and why we should care in 3-5 sentences. Climate change, along with increasing urbanization, is the cause of so called urban heat islands - areas within the city with a significantly higher temperatures than the surroundings. It also contributes to air pollution and stagnant air in urban areas, which leads to health problems, increasing death rates and discomfort. Describe your solution in 3-5 sentences. Installation of flexible moss fabrics will decrease the average temperature within urban heat islands through so called evaporative cooling. Additionally, moss is an incredible natural air filter that can improve air quality in the cities by absorbing CO2, particulate matters and noxious nitrous oxides. Finally, it also absorbs urban noise and looks great. As we can integrate our moss fabrics with the existing infrastructure (e.g. wrapping them around lamp poles), no additional space is required in the heavy constructed area in the city centre of Zurich. The moss fabrics can be produced modular, are easy to set up and can be easily removed when not needed. 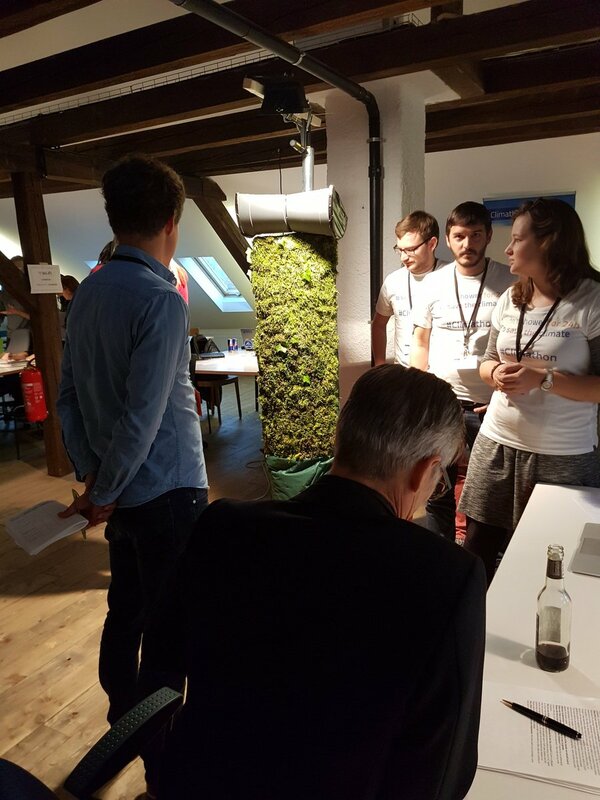 An aesthetic, trendy and green solution the moss walls will raise awareness of climate change, promote sustainability, while transforming urban spaces into green oases. Where did this project stand prior to the Climathon? Why do you think your project is relevant for the City of Zurich? Zurich is affected by urban heat islands with local temperatures at some locations being over 5 oC higher than the surroundings. Our solution can be easily used in both open spaces and the narrow and busy streets in the city. Our project can be developed and tested in a partnership with the city of Zurich and later implemented in other cities as a symbol of Swiss ingenuity against climate change. We have built a cool prototype, come and see it at our table! How can the individual reduction of greenhouse gases for a defined track be measured and reported and how can citizens be motivated to adapt their behaviour due to that collected information? The idea is to track and report the reduction of greenhouse gas emissions of a person due to walking, using public transport or bicycle instead of using a motorised vehicle. Solutions should include measures to motivate people to reduce their carbon footprint. This tool can be used as inspiration for the solution.